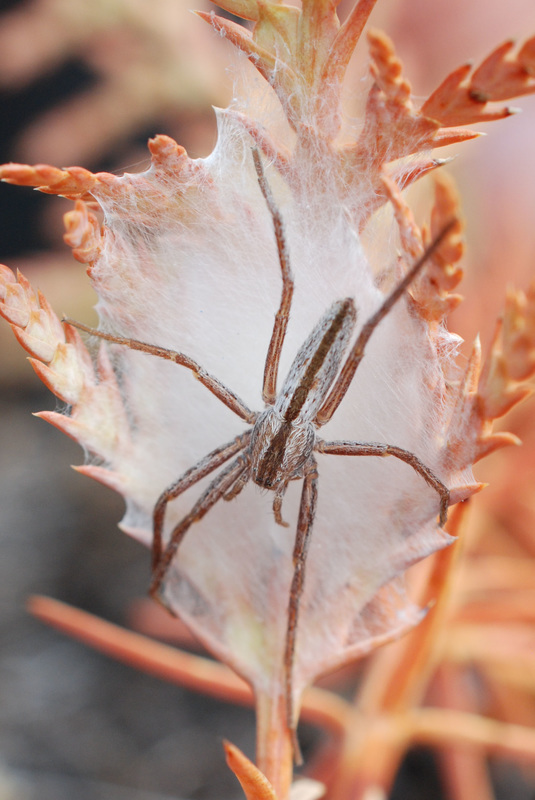 This female slender crab spider staunchly guarded her egg casing on a redcedar seedling, even though she was located in a study plot for an experiment and data collection was occurring at the time. Photos by Kelly Fretwell. This is one of four slender crab spiders (Tibellus spp.) found in British Columbia. 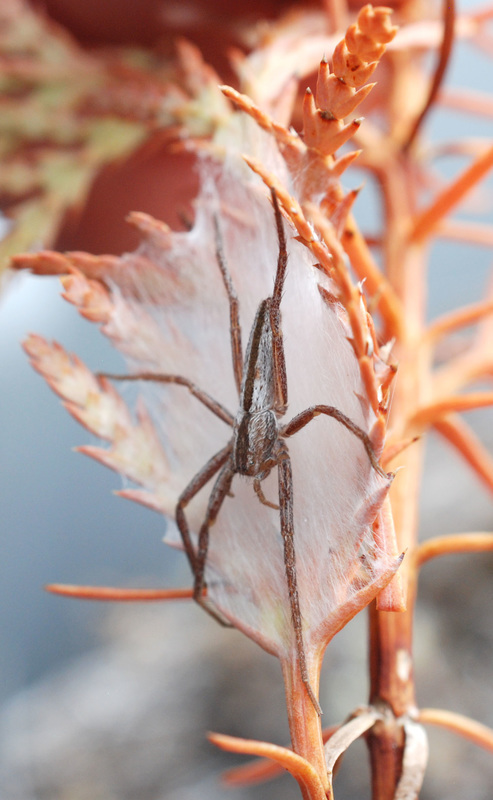 Like others of its genus, this somewhat hairy spider has an elongated, striped body well-suited to camouflaging among grasses, sedges, and other such foliage. It has one main central dark stripe on a light brownish or yellowish body, with pairs of of thin faint stripes running parallel on either side of the main stripe. It also has a pair of black spots on the back third of the abdomen. Slender crab spiders spend most of their time on grasses, leaves, stems, and stalks, where they wait to ambush prey. Their elongated bodies are well-suited to flattening and camouflaging against such foliage. Tibellus oblongus is found throughout much of the northern hemisphere, including most of North America. It is common in western and southern BC. The other Tibellus species found in British Columbia are recorded for southern or eastern British Columbia. See BugGuide for information on some differentiating characteristics. Similar genera to Tibellus include Pisaurina (larger, more robust, hairier, and have a different eye arrangement) and Thanatus (more robust, striped differently, and not commonly found on foliage) - neither of which are recorded on the Central Coast. Female slender crab spiders guard their egg casings dutifully until the baby spiders (spiderlings) emerge. Bennett, R. et al. (2014). Checklist of the spiders of Britsh Columbia. Accessed 24/08/2015. Eaton, E. R. (2012). Spider Sunday: Slender Crab Spiders (and their look-a-likes). Bug Eric. Accessed 24/08/2015. Genus Tibellus - Slender Crab Spiders. BugGuide. Accessed 24/08/2015.